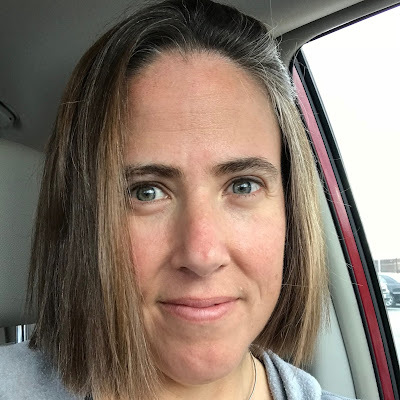 A few weeks ago, I got an email inviting my family to the National Archives for a family day event and a pre-opening coffee with a curator to celebrate their "Making Their Mark: Stories through Signatures" exhibit. 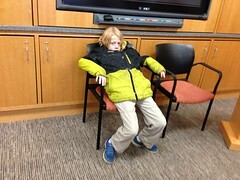 Immediately upon receipt of said email, I realized that (a) I had never dragged my kids through that particular institution and (b) I should rectify that immediately. Also, (c) I'd never been and I really wanted to see the Declaration of Independence and the Constitution and Bill of Rights in person. Our morning at the Archives came around this past Saturday and I was prepared. Museum-type spaces can be tough for my kiddos, particularly Quinn, so I made sure to not use the m-word and I pulled out the other heavy gun I had in my arsenal: I reminded them about the National Archives scenes from the National Treasure movies. We arrived to find juice and pastries as well as curator Jennifer Johnson, who gave us a personal tour through the Making Their Mark exhibit, which she had curated. It was really cool. The exhibit is all about signatures, from athletes signing sports memorabilia to Benedict Arnold's oath of allegiance to a display of pens used by presidents to sign bills into law. It was even more interesting than I thought it would be. There was a patent application filed by Michael Jackson, a letter from Johnny Cash to Gerald Ford, Richard Nixon's FBI application, and any number of other fascinating documents and items. All three of my kids were also really interested, which is notable because there are not a lot of things that my three kids are all into. One of my favorites was this display of pens that Presidents Kennedy and Johnson used to sign bills into law. One of the exhibits was a full-size door that members of a home builders association sent to President Reagan to draw attention to their economic troubles. Jack took a look at the door, listened to the curator explain that it featured signatures on one side and the address on the other, and said, "Excuse me? Excuse me? I think the president was all, 'What the bleep is this door doing in my mailbox!'" Yep. That's Team Stimey, keeping it classy across the generations. In my defense, at least Jack says "bleep" instead of actual curse words. The part of the exhibit that might have captured my kids' attention more than any other was the auto-signing machine that was set up near the exit. This particular machine auto-signed John Hancock's signature. 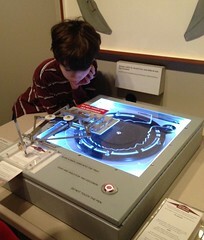 Jack might have been more interested in the mechanics of the machine than the result. 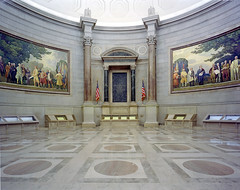 We still had a few minutes before the Archives opened to the public so the curator took us to the Rotunda where the Declaration of Independence, the Constitution, and the Bill of Rights are displayed. I may have majorly geeked out there. This may also be the place where I was reprimanded by a guard. There are no photos allowed in the Archives (barring special permission on a private tour in certain areas), so I'll give you this image provided to me. It was incredibly cool to see these documents close up. The Bill of Rights is my favorite. I asked the curator how accurate the National Treasure depiction of the National Archives was and she told me that even though none of the filming was done there, it was actually pretty close. It is here that I might have to admit to you that my kids love those films and that we own DVD copies of both of them. Anywho, from there, we headed to the public Family Day activities that were taking place adjacent to the Making Their Mark exhibit. There were all kinds of good activities for all ages. Jack matched presidential photos to their quotes and names. He may have needed some help to complete said process. 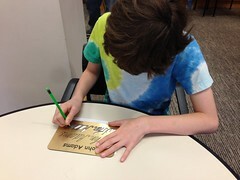 Sam recreated John Adams’ signature. And Quinn sighed loudly and often. There were crafts in another room, but the real treasure was the room set up with fountain and quill pens where my kids all learned how to write and draw using a pot of ink. Sam took approximately sixteen years to write a letter to each member of the family and Quinn and Jack drew their cats. This is a remarkably accurate representation of Oreo. I certainly wasn’t that good with the quill pen. 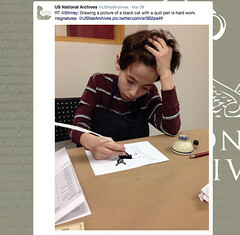 I was even retweeted by the @USNatArchives, which was also a kind of geeky high for me. 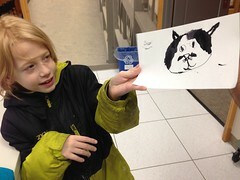 My kids are adept at cat drawings. I feel very lucky that my family was invited to this event. As I say, I've been wanting to take my kids to the National Archives for a long time and this was the best possible way to have a first visit. That said, your family can visit this exhibit too. The Making Their Mark exhibit is open through January 5, 2015.There will be more Making Their Mark Family Days on July 18 and December 30. 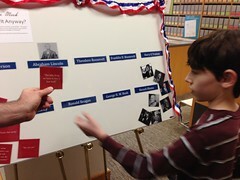 There will be Constitution-in-Action Family Learning Labs on April 15, July 10, July 23, and July 29. For more information about these events, as well as others, go to archivesfoundation.org. In other news, Jack's special hockey team, the Montgomery Cheetahs, is still soliciting donations for their big fundraiser coming up in May. Thank you so much to Sarah Elizabeth, Laura, my friend Heather and her family, and my young friends Katie and Brooke (and their terrific parents) for their donations. You can make your own donation online. In your defense, National Treasure is sort of actually an amazing movie. I like the National Treasure movies without shame. None! No shame! Well not the second one. That really sucked. But the first one is a hoot and full of many interesting facts that could very well be made up for all that I know about American history. Hee hee you have a declaration of independence, you guys are so cute. So in short, I enjoyed this post. Carry on. I'm so glad my family isn't the only one. You crack me up with your Australian way of being. Feel no shame! We own both, too, and I agree with Bec that the second one was terrible. I love how you changed the framework of the trip from "going to a museum" to "remember National Treasure?" Simply brilliant. Sounds fabulous! I need to get our fam there, too. 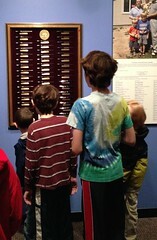 Need to recommend another museum to you -- National Postal Museum. It's pretty awesome, especially the lower level -- lots of hands on and lots of space. I think Team Stimey would enjoy it. That place looks really cool! I wish I lived close enough to visit. Don't be alarmed, but I have never even heard of the National Treasure movies. We went to the National Postal Museum once. You're right, it's totally a cool place for kiddos—and not a place that people think would be fun. I'm a little bit alarmed.